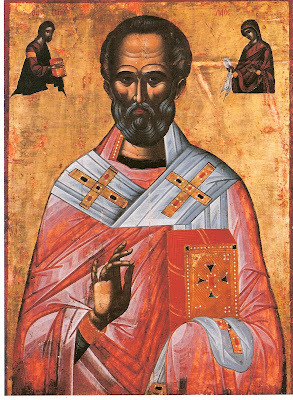 The newly-ordained Fr Nicholas' special charge as assistant to the bishop of Patara was the instruction of the faithful, a unique and uncommon role, given his young age. Nicholas approached his duties as priest and teacher of the faith with the same fervour his uncle had witnessed in him during his childhood. Despite his youthfulness, many of the faithful considered him an elder, and his ability to respond to questions of the faith in love and wisdom earned him the deep respect of those in the city. He was noted in particular for the fervency of his prayer and kind-hearted nature, and the attention to charitable work that characterised his priestly ministry. Following the injunction of Christ, Fr Nicholas sold his possessions and, following his parents deaths a few years after his ordination, distributed his inheritance to the poor and afflicted, who would often seek him out for assistance. In one of his most well-known acts of selflessness as a young priest, Fr Nicholas reacted to the intention of a wealthy businessman of Patara who had fallen on hard times and lost his fortune. Desparate, the man had determined to sell the bodies of his three daughters in order to raise funds for the family. Hearing of the plan (in some accounts, through a divine revelation), Fr Nicholas called by his home in secret during the night and threw an offering of goldâ€”three hundred coins wrapped in a handkercheifâ€”through the man's window. Convinced of the goodness of the gesture, though unaware of the identity of his benefactor, the man used the funds to arrange for his eldest daughter to be married honourably to a nobleman. Later the man arose to find the act had been repeated; and eventually, a third time. In each instance, the priest made his offering secretly, attempting to conceal his works of charity. Following the example of his bishop, who had made a pilgrimage to the Holy Land a few months before, Fr Nicholas requested to travel to Jerusalem himself, to visit the holy places of the city. Icons today continue to recount the miraculous nature of his voyage there by ship, during which a great storm arose (Nicholas having earlier predicted that it would). Seeing in a vision the devil climbing aboard the ship, Nicholas warned the crew and prayed for the salvation of the craft and its occupants, and the sea shortly calmed. Desirous above all to follow the command of God, Nicholas departed the brotherhood of Holy Sion and moved to Myra. Shortly after his arrival in Myra, the elder Archbishop of that city, a certain John, died. There was some discussion as to who should succeed him as the chief bishop of the region, the local synod of bishops desirous that the new archbishop should not be an individual chosen by men for the office, but one revealed by God. One of their eldest number beheld a vision of the illumined Christ, who indicated that the old bishop should go into the church, for the one who was first to enter it that nightâ€”who would be called Nicholasâ€”was he who should become the new archbishop. 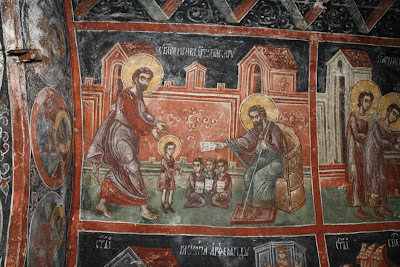 The elder bishop went to the church to await Nicholas' arrival, in obedience to the vision. When Fr Nicholas arrived, the bishop stopped him. 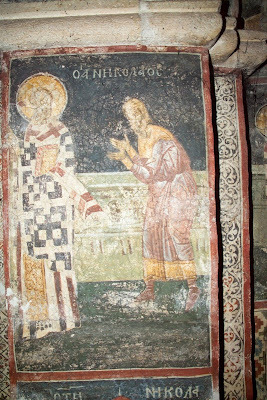 Nicholas was consecrated to the episcopacy during a tumultuous time in the life of the Church in Lycia. 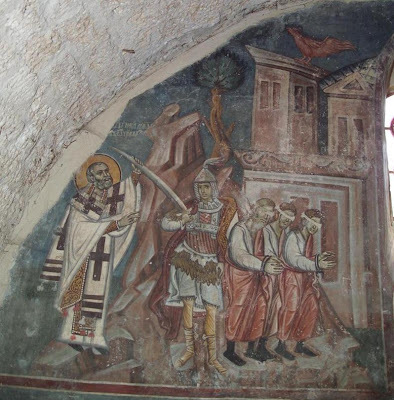 The persecutions under the emperor Diocletian (284-305) effected that region deeply, and for a time, Bishop Nicholas was imprisoned with other Christians for refusing to bow down and worship the idols of the imperial cult. He was remembered later for the exhortations he delivered to his fellow prisoners, urging them to endure with joy all that the Lord lay before them, whether chains, bonds, torture or even death. 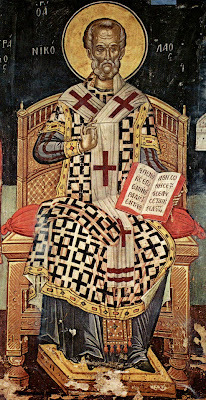 Bishop Nicholas' imprisonment came to an end with the ascension of Constantine to the throne in the early fourth century. He returned to his flock in Myra, which received him with joy, and resumed his episcopal work. He was known as a great ascetic, as he had been since his childhood, and for his gentleness and love. But his kind-hearted spirit was also one of zeal, and with the new freedoms offered under the peace of Constantine (following the 'Edict of Milan' in 312), he was known to travel through his city, visiting pagan temples and overthrowing their shrines and idols. 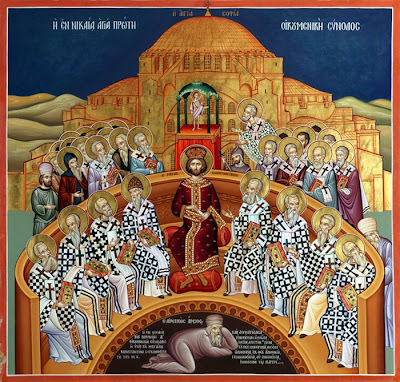 In the year 325, a great council of bishops, the largest in the history of the Church, was held in the city of Nicaea under the patronage of Emperor Constantine, who had, since his miraculous vision of the cross at Milvian bridge, himself converted to Christianity. This synod, which in later years would come to be known as the First Ecumenical Council (commemorated on the seventh Sunday after Pascha), was attended by over three hundred bishops from throughout the Christian world, to establish various canons of order for the growing Church, affirm the faith, and combat heresy. 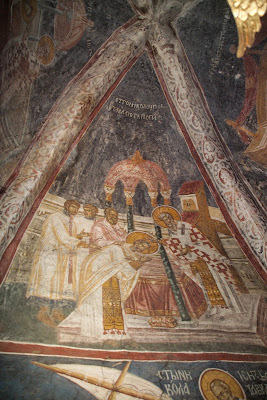 In particular, the teachings of Arius, a presbyter in Alexandria, were addressed and condemned by the council, which formulated a statement of faith that, with later refinements at Constantinople in 381, became the Creed of the Church. 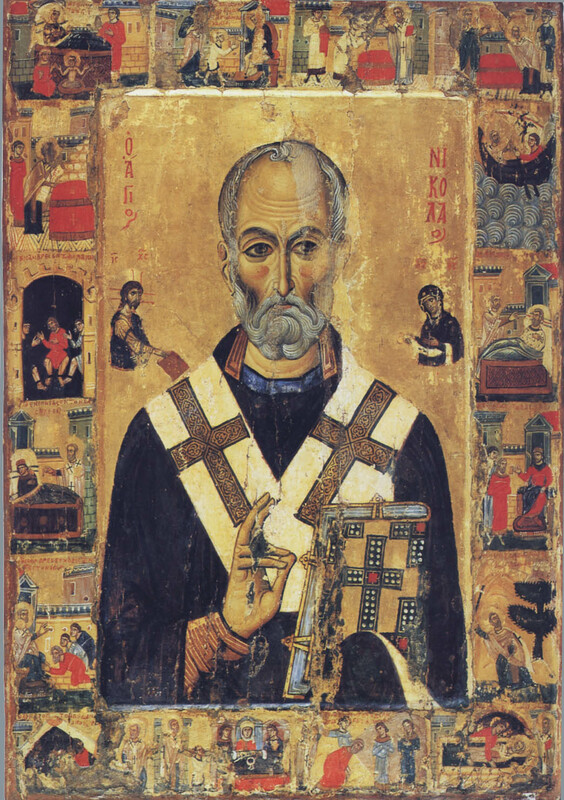 St Nicholas' title 'wonderworker' comes from the multitude of reports of miracles that issued forth at his intercession, both during his life and after. The renown of his miraculous acts was widespread in his own lifetime. As he had secretly delivered gold, many years before, to the father of three destitute daughters, so he secretly delivered gold to an Italian merchent (by some accounts, this gold was left miraculously by an apparition of the saint appearing to the merchant in Italy), convincing him to sail to Myra with a shipment of grain. And so by his prayers and deeds, his city of Myra was rescued from a terrible famine. One miracle, particularly widely known, was Bishop Nicholas' conversion of the local governor, who had been bribed into unjustly condeming three men to death. The saint approached the executioner, who had already raised his sword to issue the death-blow, and swiftly removed it from his hands. He then approached the governor and denounced his unjust action. This latter, convicted by St Nicholas' words, repented and asked the saint's forgiveness. 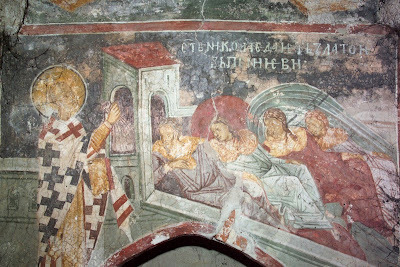 This episode is remembered as connected directly to another: for three officers of the imperial military were present to see St Nicholas stay this execution, who were later slanderously accused before the emperor, who condemned them to death. St Nicholas appeared to Emperor Constantine in a dream and urged him to reverse this sentence, which the emperor did. 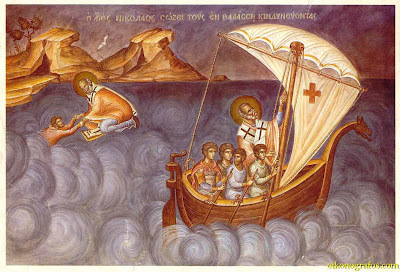 Many times, the saint's prayers were said to have saved those drowning in the sea (just a his prayers had calmed the sea on his own journey, as a young priest, to Jerusalem). Prisoners unjustly condemned prayed to him and were delivered. The poor prayed to him and were provided for. 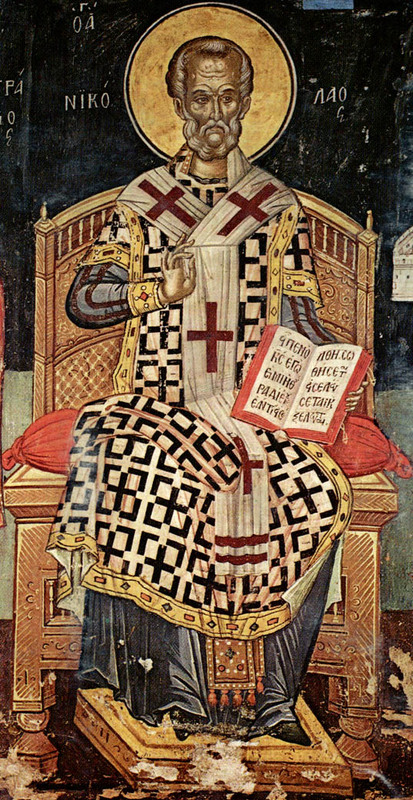 And so Nicholas' reputation as thaumatourgos was established during his life. It continues to this day. 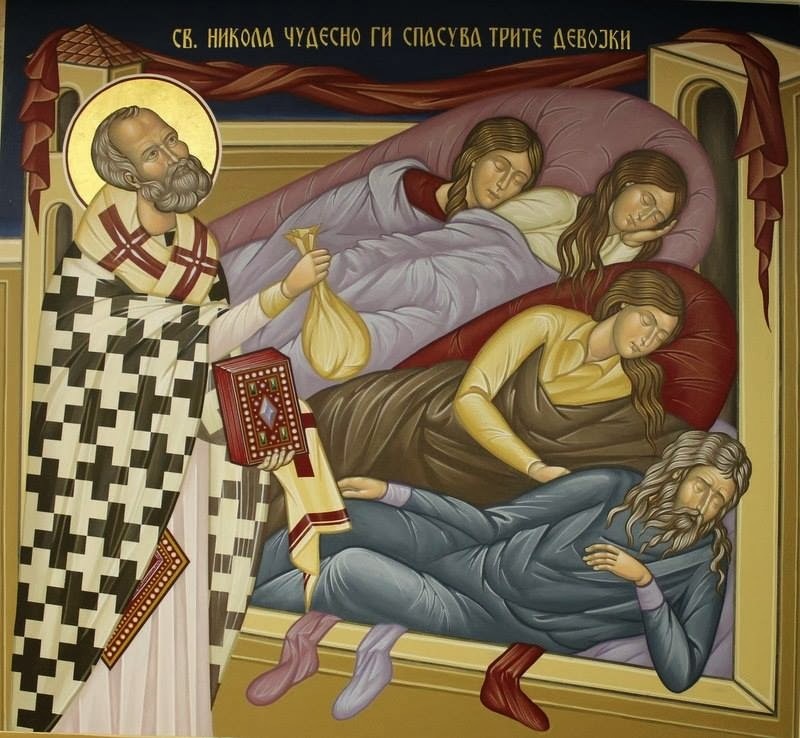 Living his life in ascetic labour and zealous ministry, St Nicholas fell asleep in the Lord at an old age (d. 6th December 343), by some accounts quite ill. A church was built in his honour by the residents of Myra, in which his relics were kept for many centuries. On their arrival in the city in 1087, the travellers from Bari found the Church of St Nicholas in Myra abandoned, save for the presence of four devoted monks. These led the men to the coffin of the saint, which they had hid to keep it safe from invaders. 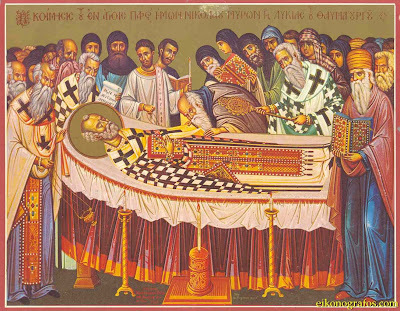 On opening the coffin, the men found St Nicholas' relics flowing with myrrh which they collected in vials, before securing the coffin and placing it on one of the ships for the return voyage to Bari, accompanied by two of the Myran monks. Some time later, the ships arrived in Bari, and were met at the port by throngs of the local faithful. 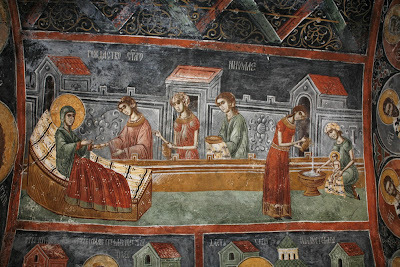 A great festal Liturgy was held in in the Church of St John the Forerunner and Baptist, to which the saint's relics were taken in procession. 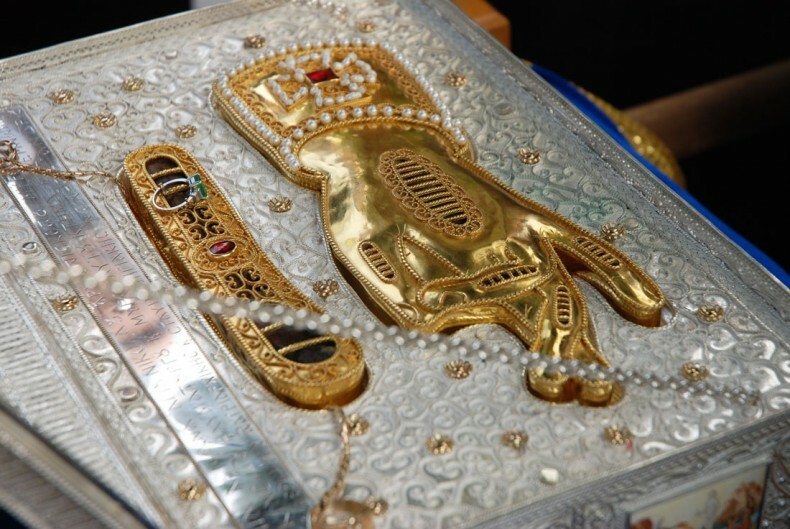 Craftsmen had fashioned an ornate silver box, into which St Nicholas' head and hands were placed, while the remainder of his relics remained in their original coffin from Myra. 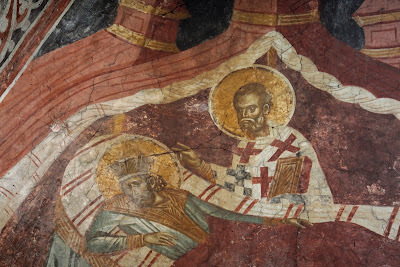 A short time later, a large church was built and dedicated to St Nicholas, and the two boxes containing his relics were transferred to it from the Church of St John, where they remain to this day (this event is commemorated on 20th May / 2nd June). Chrism continues to flow from the saint's relics, as it has for centuries. Saintly One, [St Nicholas] in Myra you proved yourself a priest; for in fulfilling the Gospel of Christ, venerable one, you laid down your life for your people and saved the innocent from death. For this you were sanctified as one learned in divine grace. 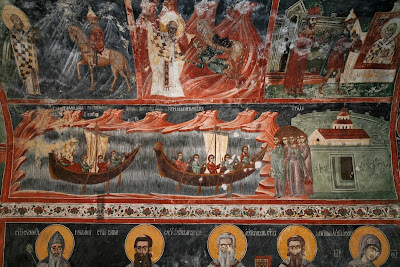 St Nicholas is often known as the patron of all travellers, and in particular of those who travel by sea. It is common to pray to him for deliverance from floods, poverty, and misfortunes. The feast of St Nicholas is kept in the Orthodox Church on 6th / 19th December. His memory is also kept on 9th / 22nd May (commemoration of the transfer of his relics), and 29th July / 11th August (his birth). Veneration to St Nicholas has always been particularly strong in Russia. This veneration stems from earliest Russian Christian imperial history. In the year 866, the first Christian prince of Russia, Askold (d. 882), was baptised with the name Nicholas by Patriarch Photius. Later, over this same Prince Nicholas Askold's grave in Kiev, St Olga founded the first temple of St Nicholas in the Russian Orthodox Church. Today, cathedrals dedicated to St Nicholas are found in Zaraisk, Ostrov, Mozhaist, and Izborsk. The church of St Nicholas at Novgorod was also later elevated to cathedral status. Churches and monasteries dedicated to St Nicholas exist in Kiev, Pskov, Smolensk, Galich, Toropetsa, Tobolsk, Great Ustiug and elsewhere. At one point in its history, the city of Moscow alone had over a dozen churches dedicated to St Nicholas, as well as three monasteries in the diocese of the city. Indeed, one of the main towers of the Kremlin is called 'St Nicholas Tower'. These are but the major churches bearing his dedication. Throughout Russia, village churches dedicated to the saint are abundant, especially near markets or merchant quarters, since St Nicholas has often been taken as the patron of merchants and travellers. The icon depicted in metal relief at right, 'St Nicholas of Mozhaisk', is especially popular in Russia. It depicts the saint in full stature, bearing a sword in his right hand and a city in his left. This icon commemorates the deliverance of the city of Mozhaisk from an attack, through the prayers of St Nicholas. According to another version, he enclosed the gold coins in an old stocking; hence the origin of the tradition of Christmas stockings filled with gifts. By some accounts, the man and his third daughter stayed up during the night to await their mysterious benefactor, and encountered Fr Nicholas making his gift. Nicholas requested that his identity be kept secret. In this expanded tradition, the father is said to have proclaimed, after receiving St Nicholas' second offering of gold: 'O merciful God, author of our salvation, who has redeemed me by your own blood and now redeems by gold my home and my daughters from the nets of the enemy, do you yourself show me the minister of your mercy and your philanthropic goodness. Show me this earthly angel who preserves us from sinful perdition, so that I might know who has snatched us from the poverty which oppresses us from evil thoughts and intentions. O Lord, by your mercy secretly done for me by the generous hand of your servant unknown to me, I can give my second daughter lawfully into marriage and with this escape the snares of the devil, who desired by a tainted gain, or even without it, to increase my great ruin.' Following this prayer, the identity of St Nicholas is revealed to him on his third visit. There is a widespread tradition that, at one of the churches in Jerusalem, the closed doors miraculously opened for the saint, allowing him unhindered entrance to reverence the holy site. This is a compilation of the bishop's remarks, taken from several accounts as seems most uniform across them. 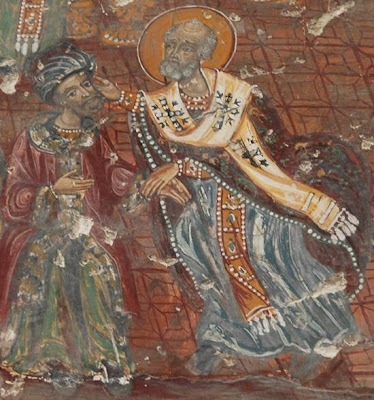 See the Life of St Nicholas on the OCA web site (see Sources, below); on The Church Messenger site, etc. From the Life of St Nicholas on the GOARCH web site (see Sources, below). Accounts of this episode vary. By some, Nicholas was in fact censured and placed under guard, and this act was later reversed upon the vision of various fathers; by others, the vision pre-empted the censure, and Nicholas was not deprived of his episcopal emblems. 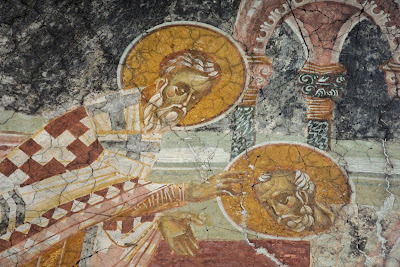 By yet another tradition, Arius complained of his maltreatment and thus Nicholas was confined, during which time the vision appeared to him, though the omophorion and Gospel book were not apparitions but real. These he showed to the guards the next morning, who reported the miracle. The bishop was then released under orders of the emperor. It is recognised by almost all sources that St Nicholas' relics remain in Bari. However, a story exists of their transfer to Russia, which some commemorate on 9th / 22nd May. " Could you please tell me the origin of the fresco which you are using as a banner?